As President of Slag Motorcycle Club, Portland Chapter, Roar Akram is proud of the club's Nordic heritage and criminal ways. He opens The Firepit as a cover for club business. But the server he hires at the bar becomes his biggest distraction. Lizzy with her sweet smile tempts him in every way. In his life, he takes what he wants. Whether it belongs to him or not. And, he wants Lizzy. She's a passive independent waitress. One day, Lizzy Wheaton has a job and the next, she's hired as a server at The Firepit. With a high medical debt hanging over her head, she gladly goes to work at the bar for a man who scares her to death. 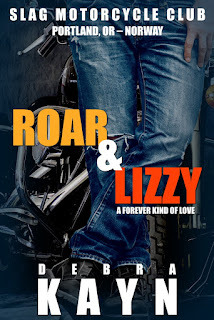 The closer she gets to Roar, the more she notices the trouble that's hitting the club. But time with Roar has a funny way of changing her—making the forever kind of love possible. They live in a hostile world. With the sole purpose of gaining the Fed's attention for their illegal activities, Slag Motorcycle Club will become the biggest threat to every motorcycle club from Montana to California. Awesome Inc. theme. Theme images by IntergalacticDesignStudio. Powered by Blogger.